Visual Task Tips is a lightweight shell enhancement utility. 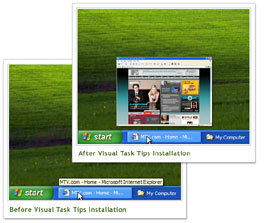 It provides thumbnail preview image for each task in the Windows Taskbar, like in the upcoming Microsoft Windows Vista. The TurboGears Ultimate DVD is a data DVD from Kevin Dangoor, the founder of the TurboGears project. My idea was to put together a DVD that offers some of the feel of pair programming with me. TurboGears 1.0 has a lot of features to cover. The TurboGears Ultimate DVD is not a replacement for the book-in-progress “Rapid Web Applications with TurboGears”. The book covers the user-level APIs in detail, but does not talk about how TurboGears works on the inside. Buttonator is not about mid 90’s online button creation; it has taken a simple idea and made it useable for real web users and designers in the year 2006. SourceForge.net: Modify: 1481912 – “CASCADE” is never enabled. No, it is the user’s responsibility to do MyTable.dropTable(cascade=True).